Desde el Fairmont Chateau Lake Louise empiezan unas cuantas excursiones. 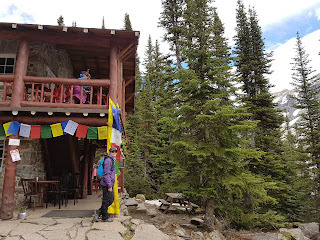 La más típica es hasta la Tea House del Lake Agnes, que hicimos en invierno y hemos vuelto a hacer últimamente. El pequeño problema que hay en Lake Louise es que es tan famoso que está absolutamente masificado, un poco como las Ramblas. 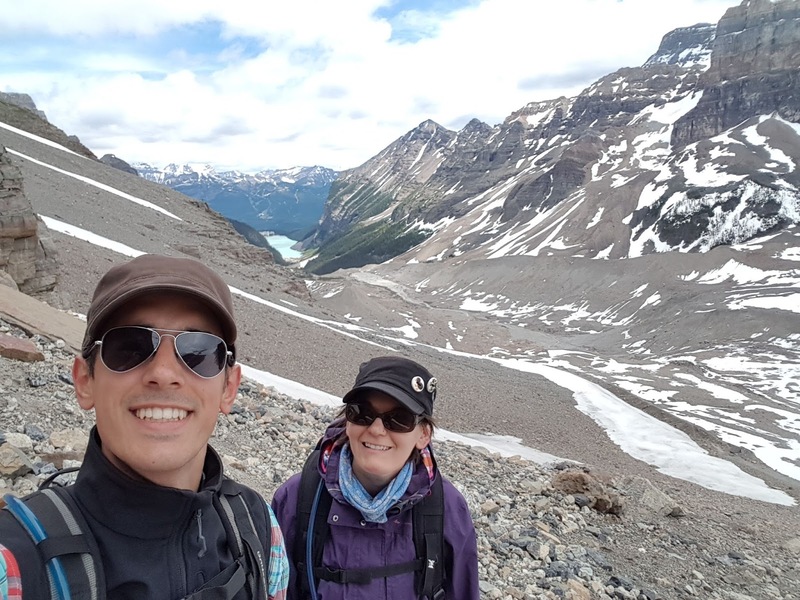 Habiendo dicho esto, todavía hay dos recorridos relativamente sin aglomeraciones: uno sube a Fairview, que ya lo haremos más adelante, y el otro llega hasta la llanura de los seis glaciares, o Plain of 6 Glaciers. El recorrido empieza rodeando Lake Louise junto a los centenares de turistas que abarrotan el camino. Una vez se llega hasta el punto en que el lago recibe las aguas del deshielo de los glaciares la mayoría de turistas se dan la vuelta. En caso de seguir recto el camino va siguiendo la morrena gigante del Glaciar Victoria durante 3 o 4 km hasta llegar a otra Tea House, en este caso igualita a las que nos encontramos en Nepal. Dejamos la Tea House atrás y seguimos caminando hacia los glaciares. 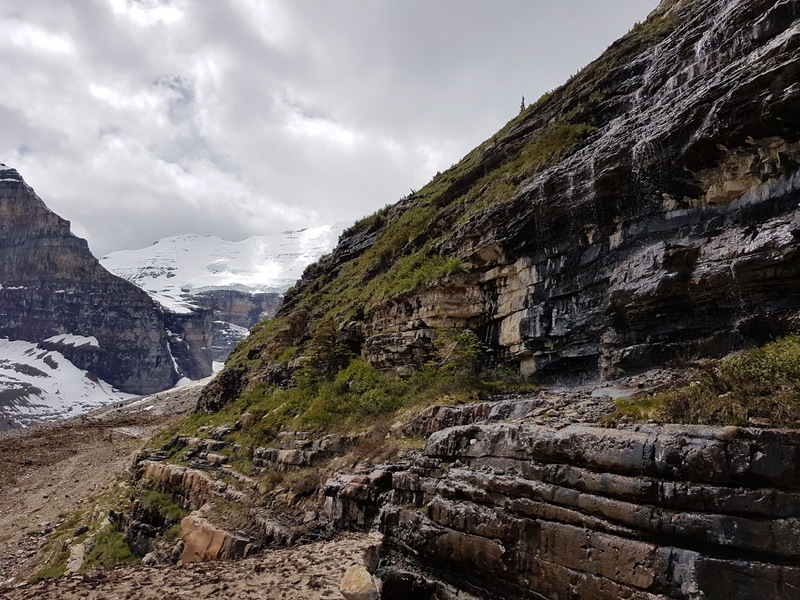 Pasados 1,3 km se llega hasta la pequeña llanura desde la que se pueden ver los seis glaciares del nombre y de propina Lake Louise. La excursión es relativamente llana y sencilla, excepto un par de veces que hay que pasar por terrenos de avalancha, o conos de deyección, que son algo resbaladizos. 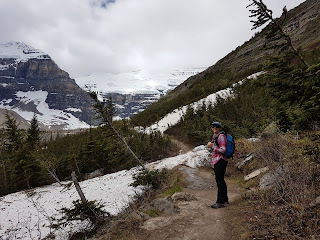 The are several trail heads just by Fairmont Chateau Lake Louise. 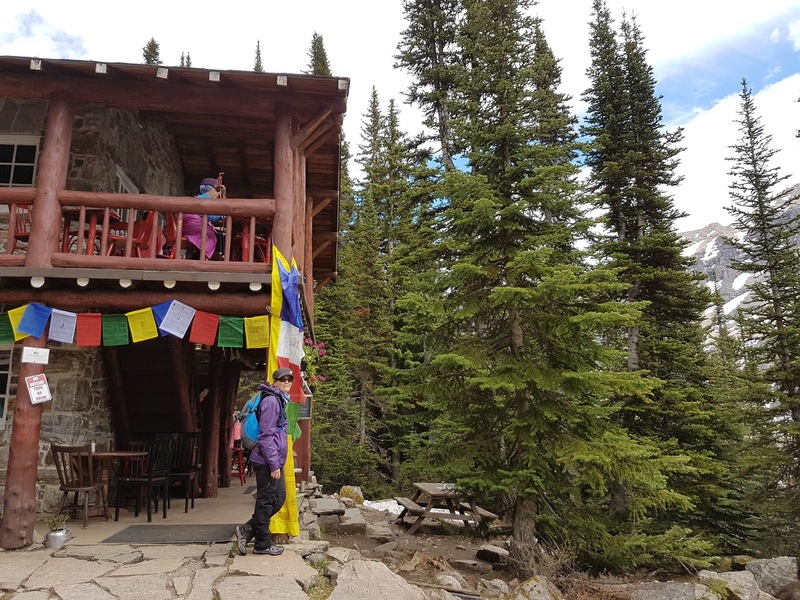 The most popular is the one that takes you to Lake Agnes’s Tea House, where we already went in the winter and where we went back just recently. 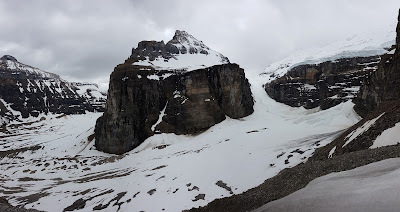 The slight problem we find in Lake Louise is that it’s so popular that everywhere we go it’s crowded, kind of like the Ramblas in Barcelona. However, there’re a couple of trails that aren’t that awfully packed. One takes you to Fairview, but it’s still not open due to the avalanche risk. 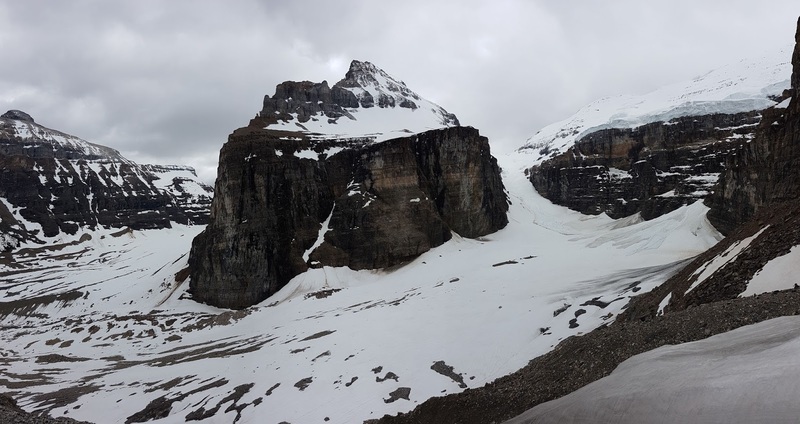 The second one takes you to the Plain of Six Glaciers. First you have to reach the head of the Lake Louise by walking along a super flat trail that follows its shore and is probably the most crammed path around here. 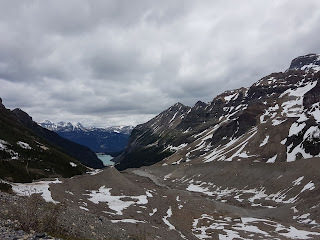 At the end of the lake, where you can see a huge flat area covered with silt coming from the eroding action of the glaciers, most tourist turn around. The trail goes on straight on one side of the gigantic morraine that the Victoria Glacier left behind. Walking that path for about 3 or 4 kms you reach a Tea House that looks exactly like the ones we stayed at when we visited Nepal! 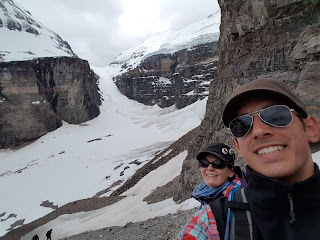 We left the Tea House behind and kept going toward the head of the glaciers. After 1.3 km you reach a kind-of-flat bit where from you can see all the six glaciers that give name to the trail and also Lake Louise if you look back. This is probably one of the easiest hikes we’ve done lately but there’re still some bits covered with avalanche debris. Still, it shouldn’t be taken light when winter conditions apply because the avalanche risk can be extreme most of the year, so always check the trail report at the Park’s stall or on line. ¡Que grata sorpresa a primera hora de la mañana! Fotos refrescantes, nosotros nos asamos.